Just call me the Con N00b. Or the Con Virgin. 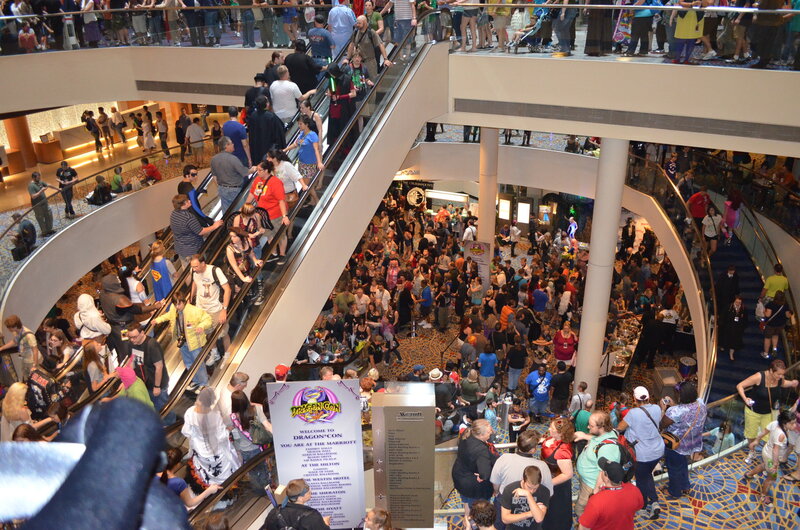 Whatever you want to call me, when I offered to participate in the Geeky Parenting panel at this year’s Dragon*Con, I didn’t realize how big an event it was. I could have tried a much smaller con first, but why would I want to do that when I had the chance to be part of one of America’s biggest geek parties?!? 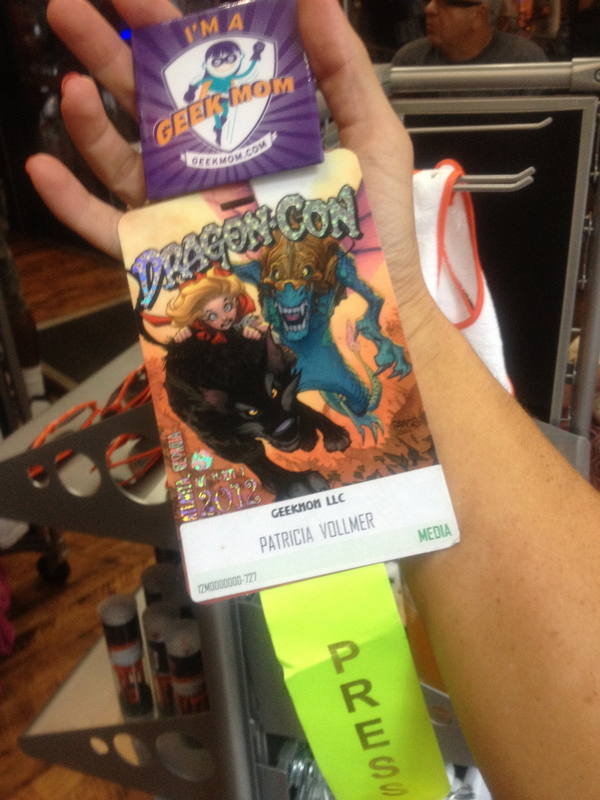 Along with GeekMoms Ruth and Mandy — both of whom have many years of Dragon*Con experience — I will be writing about my geek-out-filled weekend at Dragon*Con. Some of our posts will be titled “Dragon*Con Diary”, such as my own posts about my first experiences in geeky cosplay, bringing the kids to Dragon*Con despite many warnings of what it might be like, and our family’s great times with the Kaleidoscope, YA Lit, Space, and Science tracks. “This is for posterity, so be honest, how do you feel?” I came away from the weekend with some great memories and met so many great people. It was phenomenal seeing people of all races, genders, orientations, and fandoms hanging out and having fun without prejudice. The “track” concept turned a con of some 50,000 attendees into a more manageable experience, by choosing which fandoms/geekdoms you wanted to stick with. We quickly became acquainted with the directors and staff of our favorite tracks. My husband and I very much look forward to going again. For now I want to start with my first impressions, because they’re worth writing down. 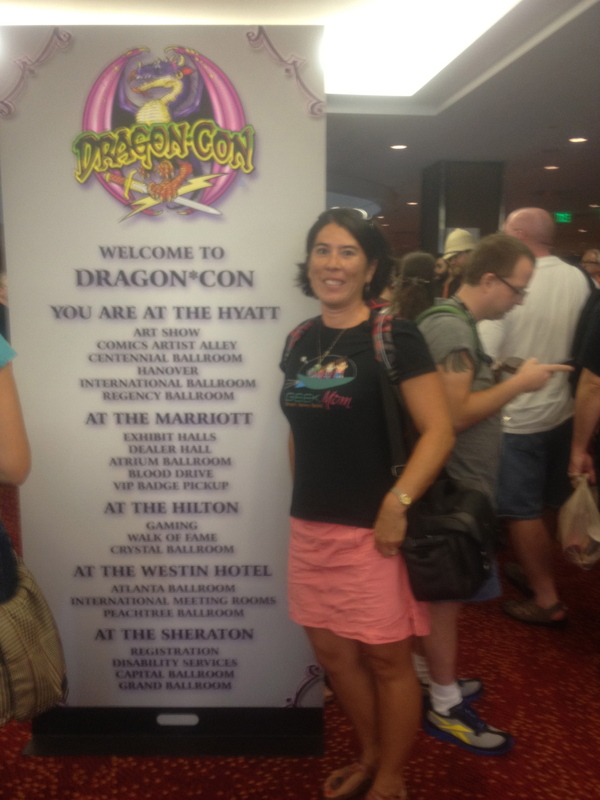 Enjoy a timeline of my Friday morning journey to Dragon*Con as we scrambled to make it to the Geeky Parenting panel. T-480-ish minutes. I need to back all the way up to 4:45am on the morning of the Geeky Parenting panel. That’s when my family pulled out of the driveway of our house on the Florida Panhandle to embark on the 6-hour drive to downtown Atlanta. We parents tend to get a bit impatient by the end of road trips, so when the kids were asking for bathroom breaks within an hour of reaching Atlanta, the answer was NO and we might or might not have been going about 10-12 over the speed limit to get to registration in time. T-120 minutes. My husband and I started worrying when we crossed the Alabama/Georgia state line near Columbus, Georgia: I would have to pick up my press badge at one of the five Dragon*Con hotels (Hyatt), and my husband and sons had to register at another hotel (Sheraton). The Geeky Parenting Panel was scheduled at the Marriott. And we had to figure out parking. While I’ve been to Atlanta several times, and did most of the token tourist attractions there, I didn’t really know how close together or far apart the five Dragon*Con hotels actually were. This is the insane level of crowdedness I had to negotiate while trying to make it to the panel on time. Photo: Patricia Vollmer. T-55 minutes. We hopped off I-75/I-85 at the International Drive exit at about 12:05pm. We quickly noticed that the hotels were sufficiently close enough together that we could walk to where we needed to go in 5-10 minutes. Since I was driving at the time, we decided I could drop off my husband and sons at the Sheraton and I would park the car at the Marriott. We began to notice all the guests in costumes walking in front of the Sheraton, which is the first of the con hotels that we drove past. The kids, my husband, and I had so much fun attempting to figure out which characters were walking around. This was also the first of the “Wow, should she really be wearing that?” costumes we saw that weekend. Let’s just say it involved a very small amount of fur and little else. T-35 minutes. Car is parked. I had less trouble parking the car than I thought. We weren’t staying in one of the con hotels; we were staying adjacent to Turner Field about five minutes away from downtown Atlanta. Guests who don’t stay in the con host hotels and would like to park close should be prepared to spend a flat $15-20 for up to a 24 hour period. If you stay one hour or 24, it’ll be $20 per day. We enjoyed the convenience of having our car nearby each of the days, and the cost savings of staying somewhat away from downtown made the $60 we investing in parking not-so-bad. I zipped into an empty space in an otherwise full surface lot. Paid my $20 at the credit card machine. I ran to the Hyatt. Or shall I say weaved between the hundreds of con guests towards the Hyatt. I was going so quickly I ended up forgetting which parking lot our car was in when we needed to leave four hours later. A kind guest took a picture of me in front of the sign so I could Tweet about my arrival. Except I couldn’t do anything on my Verizon cell phone service. The Tweet ended up going out about five hours later. This would be the case most of the weekend. Baby I’m ready to go! I was badged and ready to head to the Geeky Parenting panel in less than five minutes. Photo: Patricia Vollmer. T-30 minutes. Received my badge and press packet quite easily. The director of Dragon*Con Media Relations, Dan Carroll, was eating lunch when I was picking up my goodies and he and I introduced each other and exchanged some words about fighting the clock to arrive on time. He had just returned from driving Burt Ward to a radio station for an interview and he himself had some traffic woes on the way there. I’m impressed that I didn’t even have to say more than my name and he knew I was with GeekMom. He told me that he had the pleasure of seeing Ruth the day before. We chatted for about five minutes. In that time Mr. Carroll assured me that getting to the Marriott would be really quick and easy from the Hyatt, and he was right. T-20 minutes. I ran — no, wove — my way towards the Marriott. I was dying to stop and take pictures of all the magnificent costumes I saw on the way. But I kept my blinders on and carried on. Once I walked into the Marriott, I was faced with the hotel’s uber-confusing letter/number system for their meeting rooms. I had to get to L406, which I figured had meant “Lower” level. But no, it was the “Lobby” level which was somewhere between the Atrium level with the A-numbered rooms and the Marquis level with the M-numbered rooms. T-15 minutes. I made it to the panel with 15 minutes to spare. My husband and sons, total coincidence!, made it to the room at exactly the same time and we all walked in together as if we had been together the whole time. GeekMoms Mandy and Ruth were there and we finally were able to meet! The panel went swimmingly — a full room! — which you’ll hear more about from Mandy this week.